BRENTWOOD, N.Y. A candlelight vigil was held Friday evening for two teenage girls whose bodies were discovered brutally beaten​ and cut a few hundred feet apart on Long Island, CBS New York reports​. Candles provided the Friday night lights on the Brentwood football field as more than a thousand people gathered not for a game, but to grieve 15-year-old Nisa Mickens and 16-year-old Kayla Cuevas, CBS2’s Jessica Layton reported. “It’s going to be difficult the rest of our lives,” Nisa’s father, Robert Mickens, said. Earlier in the day, Cuevas’ sister sobbed at the scene where her body was found earlier this week. Mickens and Cuevas, best friends for years, both had dreams of playing in the WNBA. A growing memorial marks the spot where a passing motorist discovered Mickens’ body Tuesday night. Cuevas’ body was found in a wooded area off Ray Court less than 24 hours later. 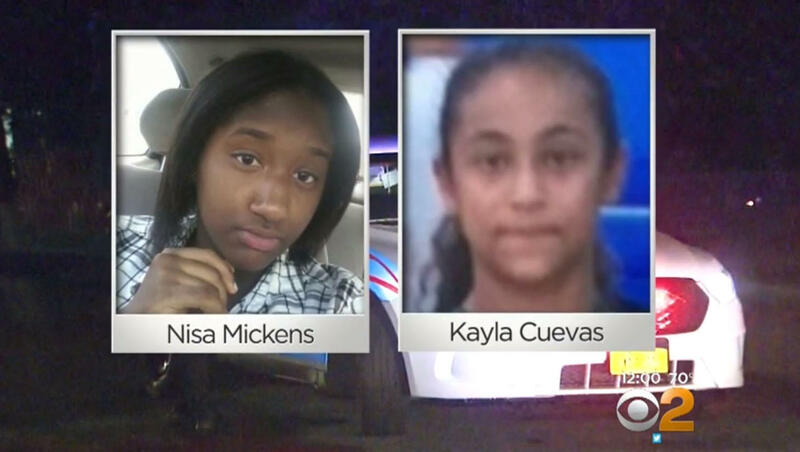 Both girls died of blunt force trauma. They had been hanging out Tuesday, celebrating Mickens’ birthday, when they were apparently attacked, police said. Mickens would have turned 16 on Wednesday. There are strong indicators the attack was gang-related, police said. He wouldn’t comment on what may have led to the murders, but said there is very little doubt that gangs were involved. “The nature of their injuries is an example, and I’ll leave it at that,” he said. A $5,000 reward is being offered for information leading to an arrest and conviction. The devastated community is asking not just why the two girls were targeted, but how they could have been beaten and left in a residential cul-de-sac with no witnesses. “I don’t know how no one seen it or heard anything and if they did, I don’t know why they didn’t say anything,” one local resident told CBS2. “There are ways that you can communicate information that you know. There are hotlines you can call that are anonymous,” Suffolk County Legislator Monica Martinez said. This hits home for her. She was an educator who knew the victims in middle school. “Never would I have even imagined that it would have been two girls that I personally knew and served as a mentor to, especially Kayla,” she said. She and colleague Tom Cilmi, who also represents part of Brentwood, agree that more can be done to reach vulnerable children to prevent the gang violence that’s gripped the community. “This is a battle that has been going on for some time and will continue to go on for some time. … For as long as children feel like they don’t have hope,” Cilmi said. Anyone with information is asked to call the Homicide Squad at 631-852-6392 or anonymously to Crime Stoppers at 1-800-220-TIPS.